Today’s article is directed to all the geeks of Cheat Engine and for people like me who has tried to use the network functions of Cheat Engine to connect it to CEServer (Cheat Engine server) emulator NOX. The procedure described will find that, as regards said, the NOX emulator. However, unless the commands used, it can also be used on other emulators, and even on physical devices that have the active root permissions. For those who do not know the Cheat Engine network mode, it allows you to connect your Cheat Engine that you have installed on your desktop to an Android device, whether it’s emulated or physical. In other words you can use desktop application, the process of the game on Android, as if this was a job that is on your PC and not on an external system. You’ve already seen two possible ways to use Cheat Engine on Android games. Take advantage of an emulator and use the PC application version, or install the Cheat Engine app directly on your Android device. To these two, I want to add a third that adds more functionality to search for the cheat, or the ability to perform the scan pointer, the search for and write access to the address. 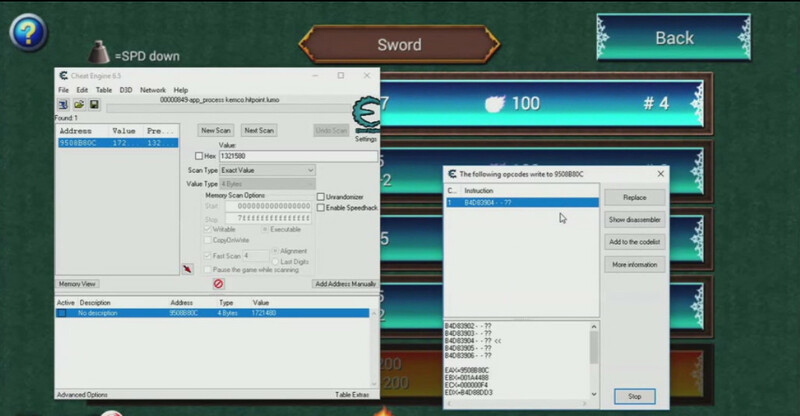 Using this feature, it is possible to de-assemble the code to be able to trace the instructions that modify the value at stake and replace them with others that, for example, instead of decreasing life points, leave them unchanged or even increase them do. On Cheat Engine there is a good tutorial on how to perform this substitution (and many others) and being a feature of the very advanced program and requiring minimal knowledge of assembler language, i will only indicate in this article how to activate network functionality. If anybody wants more explanations about it, write to me in the comments and i will discuss the subject with a specific article. This possibility is unthinkable, at least for the moment, the app for Android Cheat Engine, it also does not shine certainly for ease of use or sublime graphics. You might be inclined to think, like me, that you can use it directly on the emulator processes, but those who have already made some tests will have seen that you can not use these features, or just do not get any address. In addition to this new feature, the remote connection mode allows you to uniquely identify the process to be processed for game searches on Android, greatly reducing the amount of memory to be scanned during scans. In order to activate the Cheat Engine network, you must first have installed on CEServer emulated Android device or not to be. as is logical, you must have the active root permissions, as CEServer needs access to the active processes. The next step is to have the correct version of Cheat Engine. As suggested by the official website of the application, support to remote connection is stopped to version 6.5. For testing, in this article, i followed this suggestion, but i think that the new versions are also compatible. As soon as you’ve started Cheat Engine on your desktop and CEServer on the NOX emulator, you should be ready to use the Cheat Engine’s network feature. The problem I have encountered is the impossibility for Cheat Engine to access CEServer, since NOX does not expose this service to the outside. If we access the network section, we do not find any remote servers to connect to and can not connect by defining the local address and port. that you find in the bin folder of NOX. Also remember to turn off or add an exception to your firewall on the indicated port, otherwise you may get stuck and you will never understand why. Actually using this command alone, I failed to properly activate the feature, as it was reported the presence of several emulators on my desktop, when in fact I had only one active. To do this, enable network mode from process selection, used as a localhost server, and how to port the one shown. You can select the processes on Android and use the full functionality of Cheat Engine, including scan pointer, etc etc. However as far as I could see from my testing, applications often go to crash or hang, so you can not always use these new features. I have given you the input, now is up to you to test and play with these new tools. To be able to touch and see how it actually works Cheat Engine with active networks, i will show you how you can make the search for a cheat using this mode. Start the game of your interest in NOX and select a value for which to search. Select Cheat Engine Network Mode and Connect to Android. Select the game process you are interested in. Enter the value you have decided to use and start the search. If you get a unique address you need to perform some action in the game that he does change, go back to cheat engine, enter this new value and continue the search. Repeat this step until we found one or a few addresses to be tested. After finding one or a few addresses to test, add them to the address list and change the value. If you have modified the correct address, you will find the updated value in your game on Android. Today’s article deals with a subject that can also have very complex aspects. As mentioned above, i wanted to let you know about a problem that i solved about the ability to enable the Cheat Engine network on NOX. If you are interested in deepening the subject, please write me your comments and remember to subscribe to my pages and my YouTube channel, to stay current on my latest articles and to show me that what i write is of your interest.